Tried at 80x and 150x. Round, diffuse, evenly bright. A brighter star at the western edge. At 12x well seen with averted vision as small, granulous brightening. At 50x very nice view. Appeared like diamond dust. The brighter star on the western edge evident. M52 itself easily visible as roundish, diffuse brightening. With averted vision many fainter stars perceptible. At 18x partly resolved with averted vision, evenly distributed, rich, relatively small. At 75x almost entirely resolved. The background appeared still slightly brightened. One brighter and two moderately bright stars arranged in a chain, surrounded by an elongated, diffuse glow. Central star appeared orange colored and was quite evident. Located north of a 5.94m star, somewhat apparent. About 5 stars visible with averted vision, background appeared brightened. Two bright, evident stars with an elongated cluster of rather faint stars, which can be partly resolved. The background appeared diffuse. At 33x pretty well resolved, but the background still stayed brightened. Very compact cluster of mainly fainter stars. 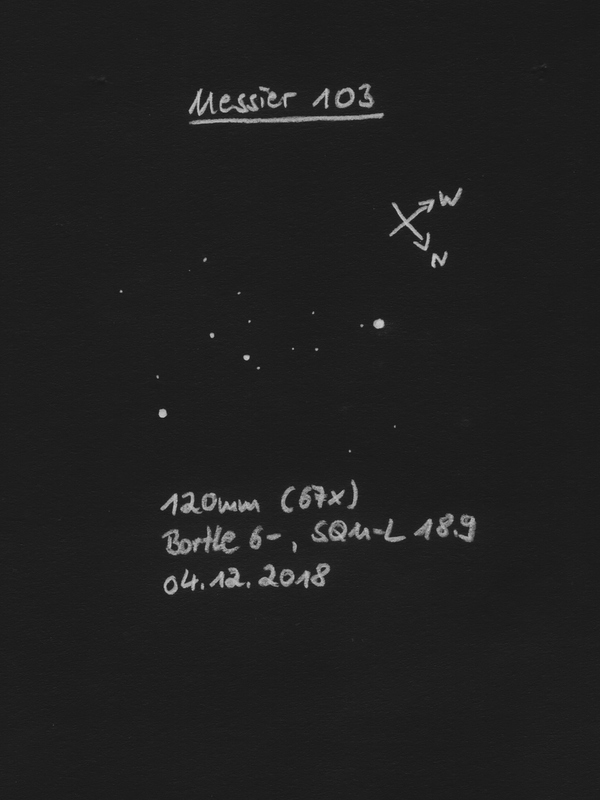 At 100x about 5 stars visible, background appeared brightened. Compact cluster, which is already slightly obvious at 37x. At 100x I could at least see 4 stars forming a semicircle. Obvious, fairly bright, diffuse, round. Conspicuous. 4 brighter stars at the edge of the cluster, which contains rather faint members. Good contrast to the surrounding. Looks like a star cloud. Relatively large, faint, nearly evenly bright. Barely visible with direct visible, but overall quite faint, relatively large, diffuse with slight brightening toward the middle. At first glance large, evident brightening, with averted vision granulous with some individual stars. Nice, large cluster near the prominent Double Cluster (NGC 869 & NGC 884). Best view in binoculars due to its angular size. Its sobriquet comes from the similarity to a muscleman. I have never seen this strong man consciously. Large with many rather faint stars of similar brightness, evenly distributed. An evident, slightly curved star chain between Stock 2 and NGC 869.